With some time off work it would be a good time to fabricate the frame parts and put it all together. - 3 lengths of 30x30 aluminium extrusion for the uprights. - 6 x T2.5 16T sprockets. Still to purchase are the end stops, themistors, extruder drive wheel and extruder nozzle and I still need to print the extruder parts. I like the 5:1 extruders so will go this way I think. the extruder that RichRap uses has been proven to work well so a good place to start. I am still undecided on what type of heater bed I am going to use. A 240vac version will be much easier and draw less power and I am steering towards a silicone heat pad at present but we will see. The three 30x30 frame uprights are just under 1,100mm in length and were cut using a mitre saw. Then, since each end of the extrusion will be bolted to the floor and roof plates I drilled a 7mm hole then tappped an M8 thread into the extrusion. The important thing here is to ensure there are no burrs as this will cause the extrusion to not sit flat when bolted to the plate and therefore introduce the wobble in the frame. I opted for 6mm thick aluminium plate for these parts. The original plan was to drill all the holes using the mill and DRO but sinve my mill only had 250mm in the Y axis it would be inpossible so purchased the plate and sent it, together with the .step files over to my local laser cutter to cut. the results were outstanding and given that Delta printers rely on acuracy, this was the most important thing for me. Cost wise the 3 plates cost $110 to cut but well worth the money. Having the base, bed and roof plates laser cut was one of best things I could have done as the accuracacy is second to none. Once the smooth rods and vertical extrusions were cut to the correct size it was jsut a cose of bolting the peices. I started by bolting the vertical extrusions to the base plate first, fitting the stepper motor shaft end supports into the extrusion then fitting the 3 stepper motors. This was much easier to do without the bed plate fitted. The stepper motor shaft supports have a 625zz pressed into them and a 5mm nut and cap screw which goes through the bed plate. This allows for adjustment of the bearing centre height to suit teh stepper shaft. The idea behind the supports is to stop deflection of the stepper motor shaft when tensioning the belts which will stop premature failure of the shafts. Next to be installed was the bad and roof plates, linear shafts and carriages. The bed plate is supported by six 90° angle brackets which allow for adjustment of the plate. The roof plate is bolted to the vertical extrusion and has three angle brackets. The 12mm linear rod passes thought 12mm clearance holes in the plates and are secured with 3D printed mounts that are bolted to the plates. All in all it make for a very strong and rigid structure. he belts used as mentioned earlier are T2.5 polyurethane steel reinforced running on 16T sprockets. I opted to use sprockets also for the idlers to ensure the belts are not stressed when going around the diameter. The tensioners were 3D printed with 2 x M5 bolts and nuts fitted for tensioning and an angles slot to allow quick removal of the idle pulley. Like the stepper shaft supports they are also made to slot into the alluminiun extrusion profile for added rigidity. The pulley is supported each end with a 625zz bearing so runs very smoothly with little friction. As seen in the picture below there are also 2 M4 cap screws going throught the body of the tensioner to stop the printed part ever delaminating under load. 2 longer bolts are the belt tensioners. The diagonal rods are made from 10mm OD x 8mm ID carbon fibre tube that was cut to length using a jig to enable all the rods to be the same length. The rod ends were made from M8 mild steel bolts. In the lathe I turned the flats off the bolt head, then using a 10mm ball nose end mill cut the pocket into the bolt. By using rocol cutting fluid it is possibel to get a near mirror finish on the parts. To ensure all the pockets were the same depth the bolts were pucher hard against the lathe chuch, and a stop was fitted to the tool pust for teh drill chuck to hit when home. The treaded portion of the bolt was then cut off leaving a 27mm shaft plus the head. This provides plenty of metal for the magnets on the effector and carriages to hold onto. The metal rod ends were then cecured into the carbon fibre rods with epoxy glue. To ensure they are all the same length a jig was used consisting of 10mm balls and my mills x axis table and DRO. These were then fitted to the linear carriages and end effecto and finally it is starting to look like a 3D printer. The printer stands 1100m high and is 540mm wide. Weight wise it feels around 25kg. After much research I bought a smoothieboard 5XC controller from Robotseed and couldn't be happier. Admittedly this was the part of the build I was most worried about especailly after reading some have spent weeks trying to get their printers to work. Well, my worries were unfounded and the Smoothieboard has surpassed all my expectiaions in build quality and easy of uses. The guys at Smoothie have done a great job with the instructions and almost every question I had could be found online. Also the SD card that is pre-installed in the board has all the files, software like Slic3r, Cura and Pronterface, plus masses of documentaion to cover everything one could imagine. The user forum located here was also great for getting questions answered fast by the developers. The installation guide located here covered pretty much everything I needed to know and within a few hours I had the printer up and running. 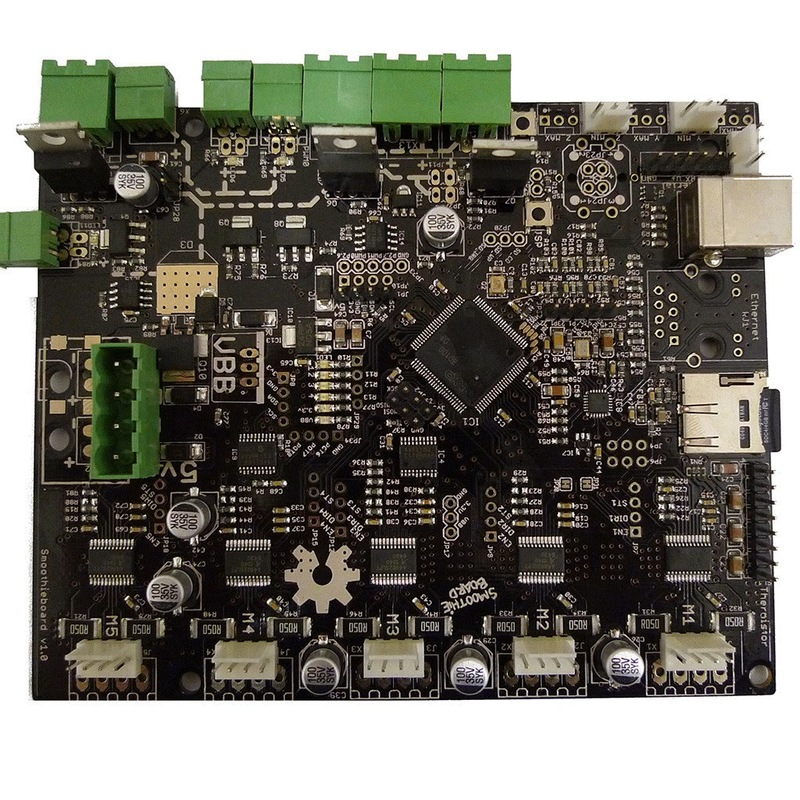 There is no firmware to muck around with and if anything needs to be changed it is done by opening the config file in a text editor, changing the value, saving the file and rebooting the board. For a delta printer a few extra lines are codes need to be pasted into the text file. This allows the input of the ARM_LENGTH and ARM_RADIUS. I also altered the max stepper current which I set at 1.3A, although my stepper have a maximum current of 2.5A. This has not affected their performance and my initial movement tests at 150mm/s proved that. Other settings that need to be changed are steps_mm, speeds for homing, and possibly the motor direction. You also have the option of downloading other peoples config files for delta printers and use their config but this would be more useful on generic printers, not custom ones. Most of these can be found on GitHud. Anyway, I wired the motors and enstops and loaded the supplied Windows drivers for the Smoothieboard. The baord was then connected the board to an external 24vdc psu and the board plugged into my computer USB port. The best thing to do here is to eject the printer via the "Safely Remove hardware" icon to avoid any hangups. I found if left mounted Proterface would freeze occasionally. Then go into device manager and set the USB port speed to 115200 to match the smoothieboard. I opened Pronterface and connected to the smoothieboard via com6. A few settings in Proterface needed to changed like build area etc and this will be different for every printer. Pressing the console home icon casued the carriages to head upwards until they hit the end stop switches, then they backed away and moved up slowly for a second more accurate position. I was not happy with the fast homing speed so I redued the fast_homing value in the config file, saved and rebooted the board. A second test was much more to my satisfaction. The video below is a motion test at 150mm/s . I printed a pen mount that fits the end effector so I could see what is was doing when printing. The result was fantastic. I also have the full function LCD for the smoothieboard that needs to be wired in but I first need to work out which pins need to soldered to the board for it to run. I have the V1 shield but there is a V2 shield ariving soon. I will try and print an extruder thisafternoon if all goes well but will need to wait until some thermistors arrive to test the extruder properly. Nice Work! Where did you position the N42 magnets, behind the socket shafts inside the diag tube? Green_guy, the magnets are actually the balls glued onto the carriages and end effector. The rod ends at each end of the carbon fibre tubes are just M8 bolts with sperical pockets milled into them. I opted for spherical magnets for increased magnetic strength which I did achieve, however they are a little harder to assemble as the balls are attracted together so a little care must be taken when glueing them into the pocket.